Railfan Mark proudly shows off 922's new livery of blue and gold. Her painting now renders the Naga version of the Filtrak livery extinct, while the livery itself is almost extinct on locomotives. It is quite possibly the shortest livery to have ever existed on MRR/PNR locomotives. 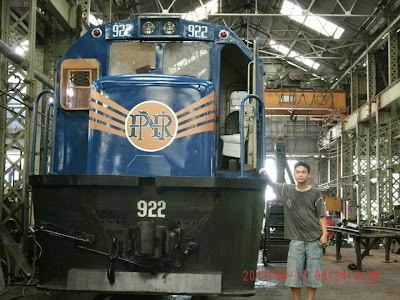 My Dad, the Late Jesus G. Alparaque worked all his working life with the Philippne Railway Company in Iloilo City. Today we have reconnected with residents of the Railway community in Lapuz Norte, Iloilo City, in Facebook. We have about 150 members now, and are planning to have a 'Railwaynian' reunion in April 2012. We have shared stories and anecdotes of the life we shared, growing up, bound together by the one link that tied us, as a one big family of the railway operations and community. I, like yourself, am at a tremendous disappointment in how this once priceless part of Panay history has vanished into thin air. The Railwaynians are original residents of the Railway compound and communities, and we can tell you stories that will bring you laughter and tears. I hope you can join our global reunion in Iloilo City next year. I Appreciate all your efforts in your quest for putting the Historical pieces of the Philippine Railway. Pat Alparaque- A Railwaynian from Panay.